Shotton Colliery was a nineteenth century ‘new town’, built a mile or so to the north-west of old Shotton village. The pit was sunk and began operations in the early 1840s, struggled on for a few decades – never being very profitable (if at all) – before closing in the mid 1870s. The 1881 census returns for the colliery town indicate that a huge number of houses were empty, which has led historians to believe that the place was akin to a ghost town. When the pit closed, folk had no alternative but to up sticks and move in their search for work – a common enough exercise for your average pitman family. The houses built during the 1840s and ‘50s were simply left behind as the workforce moved on. As the 1880s and ‘90s progressed, the population grew even thinner, until only a handful of folk rattled around the empty streets. However, in 1901 the pit was reopened, the houses re-fitted within weeks (it seems that no vandalism had taken place), and the town burst back into life. By 1906, over a thousand men and boys were in employment, rising to almost 2,000 by 1913. The coke ovens and brickworks were reopened, too. It quite literally boomed. In the 1950s, however, the decline began to set in again. Prior to the colliery’s final closure in 1972, most of the old housing had been demolished – and today there is little sign that a pit ever existed there. Further reading here. Pictures here. 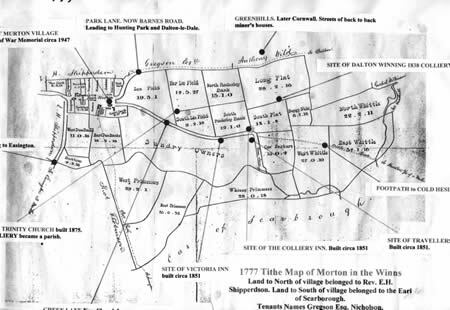 28th Sept 1844 – One of the most destructive explosions which ever occurred in the Durham coal field took place at Haswell colliery, the property of Messrs Plummer, Taylor, and Co., when ninety-five human beings were deprived of life. The explosion occurred in the Hutton seam, almost immediately after a fall of stone from the roof, which had liberated a vast quantity of gas; and only four persons in the mine succeeded in escaping. 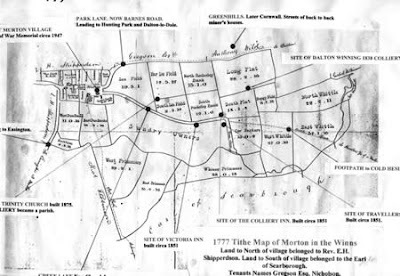 On the 30th, fifty-four bodies were interred side by side in South Hetton churchyard, thirty-one at Easington, and the remainder at more distant places. The pit had been seven years at work, and was considered a very safe one. A subscription was immediately set on foot for the relief of the sufferers, and the sum received amounted to £4,264. Ironically, the disaster struck a few weeks after the debilitating Miners’ Strike of 1844. The colliery had opened in 1835 and closed in 1896. Nothing of the colliery village remains – though a ruined fragment of the pithead itself still stands, accompanied by a modern-day memorial to the 95 dead. In days of old when hare coursing and hunting were a popular sport, the men of the area around Easington were constantly taunted by an animal which seemed forever beyond their grasp, namely, the legendary Easington Hare. One day, when they were out hunting, they fell upon the troublesome creature in Castle Eden Dene, a couple of miles to the south of the village. Setting off in pursuit with their bloodhounds leading the way, the men chased the hare across the fields until they reached Easington village. Here, however, the beast gave them the slip once more, squeezing through a hole in the wall of a cottage – but not before one of the dogs had briefly grabbed its rear leg. Hastening indoors, the hunting party found nothing within the building save for an old women nervously tending her injured leg. The secret of the mysterious hare’s seemingly supernatural powers had been uncovered! The men turned and left the woman and her home, and never again were they troubled by the pesky creature. Seaton Holme, Easington, is one of the oldest domestic buildings in England. What was once originally a medieval manor house is thought to date from the 1240s, and was built upon an even earlier timber-framed, Anglo-Saxon effort. It has, of course, been substantially altered over the centuries. The building has had many uses over the years, being a dwelling house for the Bishops and Archdeacons of Durham until 1832, then serving as the Rectory to nearby St.Mary’s Church. In 1921 it became a children’s home, but has in recent decades spent much of its time falling into a state of disrepair. It was recently renovated and re-opened by HRH The Duke of Gloucester in 1992, and now serves the community as a Discovery Centre for the area’s local and natural history and a meeting/conference venue. Legend has it that Seaton Holme was once the home of Nicholas Breakspear, who went on to become the only English Pope, under the name of Adrian IV (died 1159) – though he is known to have been born in Hertfordshire, and no one quite knows where the story came from! … A small bay, called Hawthorn Hythe [Hive] … sheltered by a reef or natural pier called the Skaw. The rocks of the coast are broken, rugged, and pierced with caverns. Fifty ships, with all their crews, were lost on 25* Nov. 1824, on the Skaw; and fires used to be kindled on Beacon Hill, on the S side, to warn mariners off. On the 5th of November, 1824, not less than 50 vessels perished in a storm immediately off this part, and the crews of all were lost, with the exception of the crew of one only, who were enabled to effect their escape by means of a rope, thrown from the vessel, and brought to land by a Newfoundland dog belonging to Major Anderson. A newspaper cutting from the Northern Echo of 25th June 1913, refers to an Inquest held following the death of John Gallagher, 31, a miner of no fixed abode, who died in a cave on Hawthorn Beach. The poor man’s demise brought to the public’s attention “once again” the problem of the cave dwellers of Seaham. Apparently, for five weeks prior to his death both the deceased and his brother had been living on bread, butter and bacon in a cave two miles south of Seaham Harbour – as part of a roving community, it seems. Continually evicted by the police, these poor folk would simply move onto neighbouring caves – their old haunts being taken over within hours by their brethren. The Inquest report dwelled on the future policing policy in the area, with rather more concern being shown for the meeting of the costs and expenses incurred by this sad incident than sympathy expressed for the victim and his associates. P.S. I should be pleased to know if anyone has any further information on this story. This lovely little effort didn’t exist pre-1820, nor is there any trace of it left today, amazingly enough. Hawthorn Tower(s), originally known as Hawthorn Cottage, was built in 1821 to the designs of John Dobson for Major George Anderson, a Newcastle big-wig. 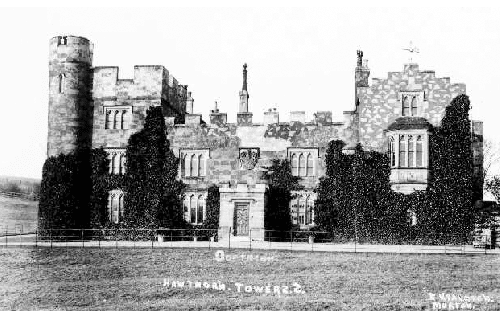 Anderson died in 1831, but his wife lived on in the property until her death in the 1850s – afterwhich the Pembertons assumed ownership and renamed it Hawthorn Tower(s). At some point in the 1850s, it was also extended in size. In 1910, the Pembertons vacated the premsies, and let the pile out, firstly, to colliery agent Malcolm Dillon, then to another colliery official, Mr Henegan. In 1930, the Boys' Brigade rented the Tower for weekend camps, and it was used during World War II by the military and the Home Guard. The Pembertons then returned briefly, before selling up in c.1949 to a South Shields man. Several more sales followed, during which period the house fell into a state of decay. Vandals help send the structure to its ultimate demolition in 1969 after a man was killed by a partial collapse. Today nothing remains. It’s as if the old place never existed. There’s a fair bit more to be found on Hawthorn Tower(s) – including the nineteenth century census returns for the structure – at the DurhamRecordsOnline website, here. This curious gazebo-like affair sits atop a lofty prominence overlooking the surrounding countryside a mile or two south of Seaham. For risk of breaching copyright, please see the structure’s form here. As you will observe, it was a splendid little landmark before the storms of December 2006. The two-storey affair was built as little more than an eye-catcher – a folly – by Major George Anderson of nearby Hawthorn Tower around 1830 – and indeed was for years known as ‘Anderson’s Folly’. It was probably used as a summer house by the estate during Victorian times, but several sources state that it became a residence around the turn of the twentieth century (as is evidenced by remains of a privy and midden). It may soon become a holiday cottage after remedial work has been completed. Or perhaps it already has! Do let me know if you can enlighten me further. P.S. Have just found an up-to-date picture here. ... with the present-day layout here (which I can’t reproduce for reasons of copyright). And now all the pits, without exception, have gone.